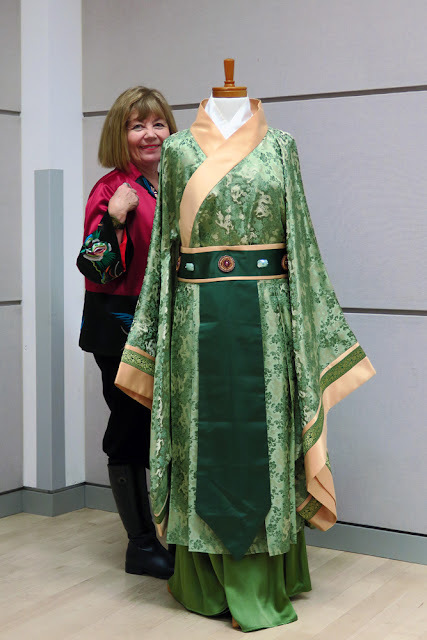 February 25th found us at the Vancouver Public Library for another fabulous SMOC event: Han Couture, a history of traditional Chinese Culture and Ivan Sayers presenting dresses and accessories from his collection and showing China's huge contribution to dress and fashion. Ivan always focuses on historical and cultural influences that shape fashion. 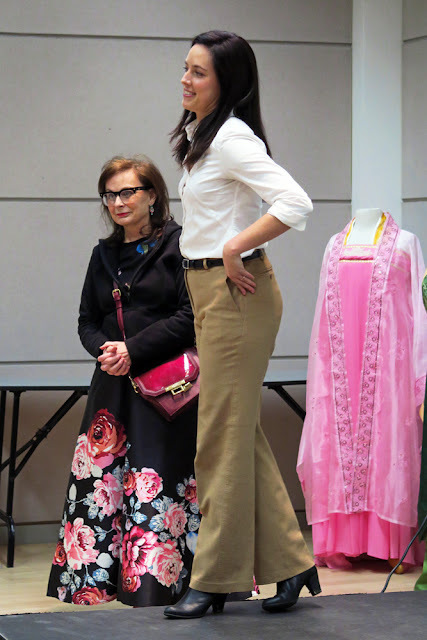 His dresses for this presentation, were examples of how traditional forms were purchased, made, copied, recycled, upcycled and adapted so that they become a meld as well as a reflection of the influence of world travel and culture brought to Canada and becoming the multicultural mix we know today. 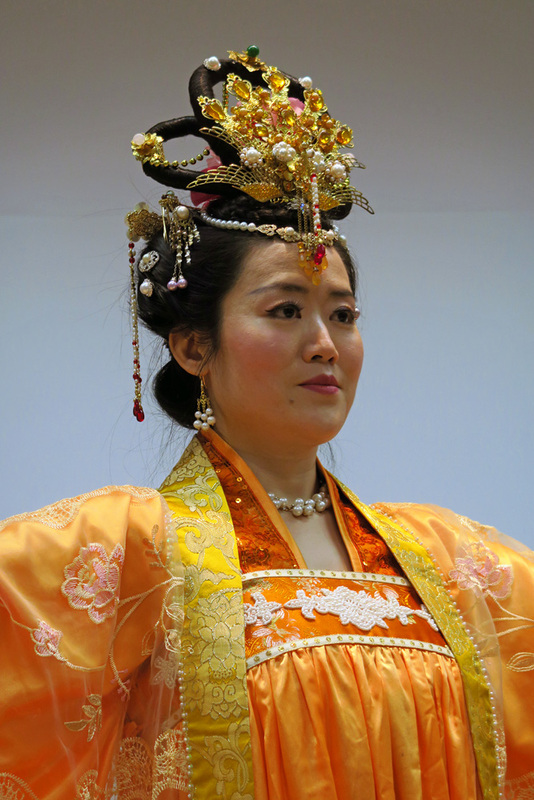 The Han Couture presentation was beautiful, displaying traditional dress for women and men. There is a resurgence of this, today, around the world. Silk, a Chinese invention, for years a closely guarded secret, is still in high demand for its luminescence, color, fit, light weight and luxurious feel. Silk, was a status symbol, especially embroidered with symbols of power, nature, visual records of tradition. 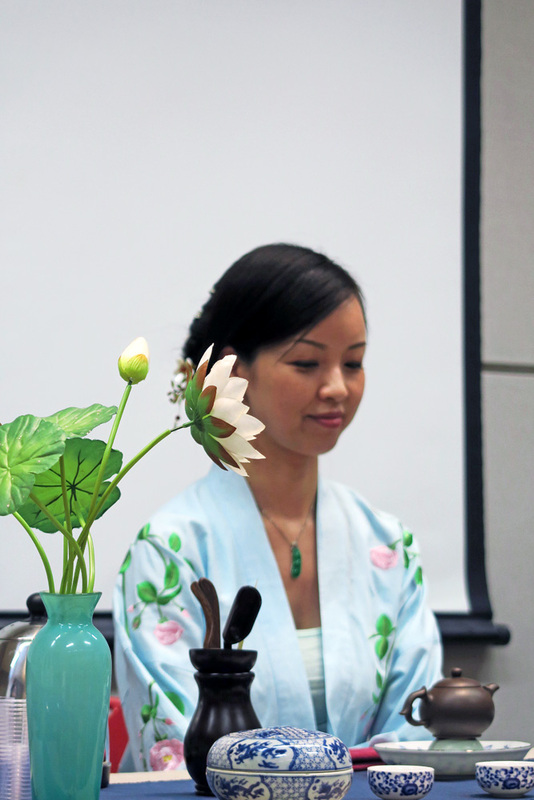 The tea ceremony was performed in exquisite detail, with table setting, and the sequence of preparation and pouring, and we could see the steam and smell a faint aroma of Oolong. Magic! 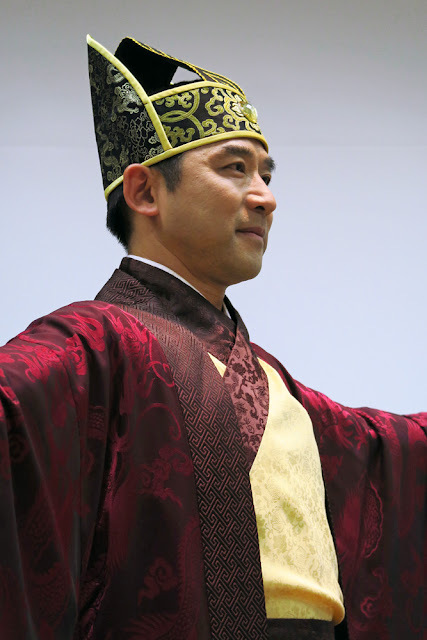 China's history was presented with accompanying visuals: maps, dynasties, dragons, chrysanthemums and traditional dress. 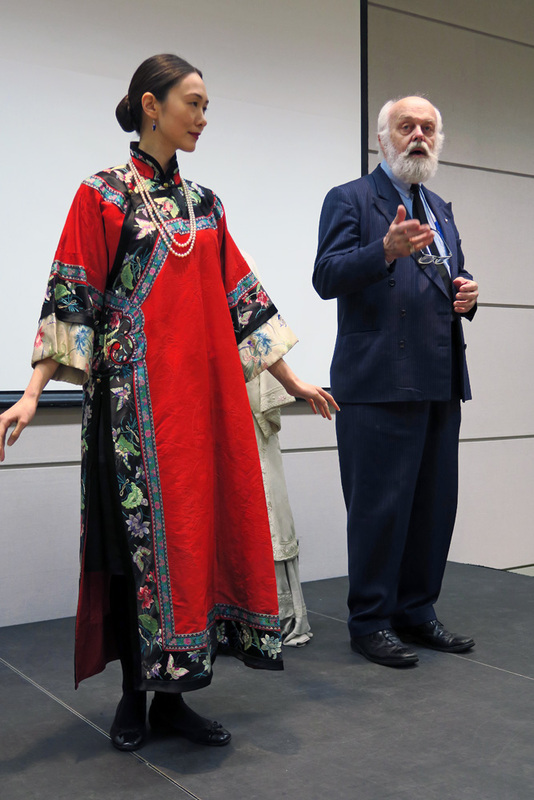 Transported to China and then seeing it in what the audience wore: jade, cheongsams, hair accessories, embroidered jackets; people dress up to come to SMOC events! 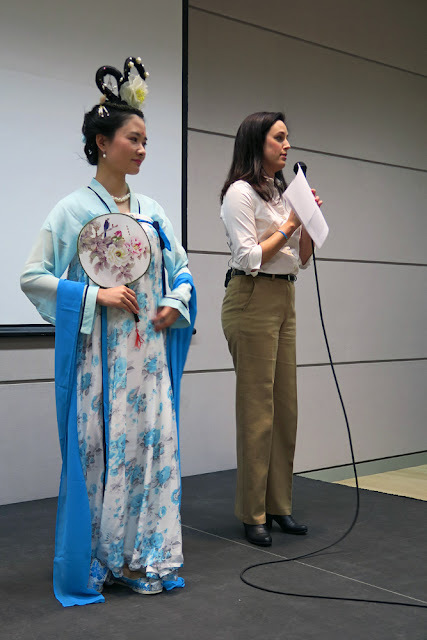 Big thanks to Sue Zhang who proposed this event in collaboration with SMOC. 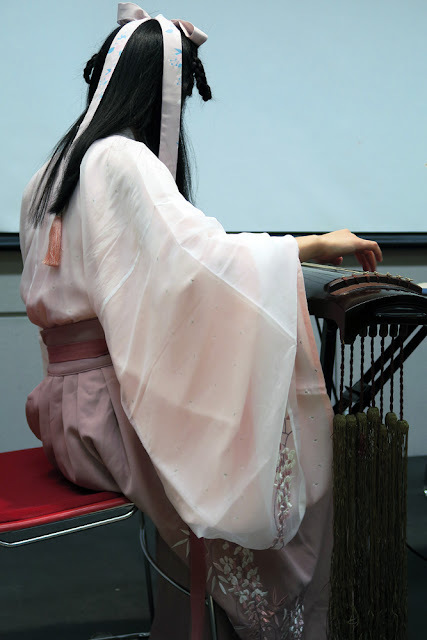 To Cora Yu who has studied ancient musical instruments and played beautifully the Gu Qin for the tea ceremony. To Tracey Wang who performed the Traditional Chinese Tea Ceremony, as she does daily, in her tea shop in China and to Cathy Tan who described each step of the ceremony for our event. Finally to Brett Featherstone-Price who researched extensively, the history of Han Fu and presented it so thoroughly!